The modernist industrial designer George Nelson once wrote, “Of all the structures and machines used for going places, the bridge is unique. Unlike the road, an earthbound strip, the bridge leaps, taking imagination with it. Like the plane, it defies gravity, but noiselessly. It moves with infinite grace without going anywhere.” More importantly, the bridge is a symbol of connection. Bridges cross chasms and obstacles to allow passage from one point to another. That’s their magic. 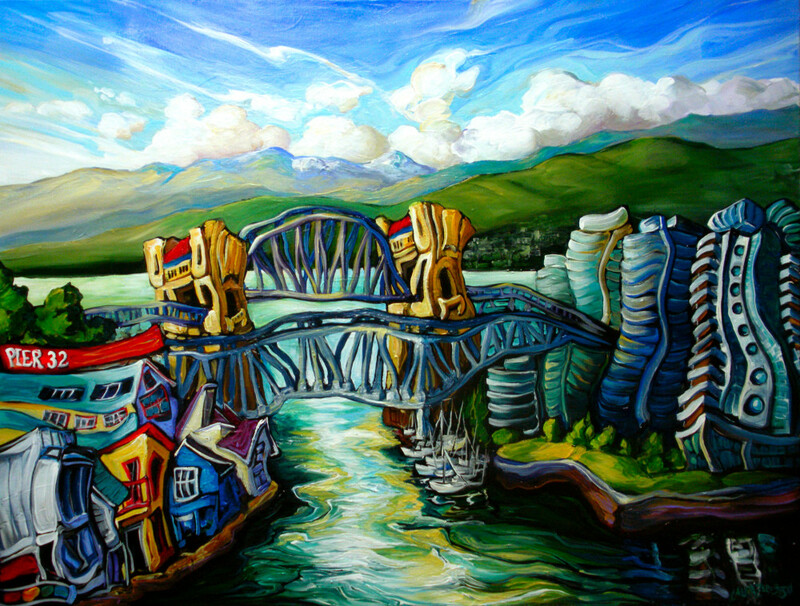 This painting shows the Granville and Burrard Bridges framed by Granville Island on the left and the downtown residential and commercial buildings of Vancouver on the right. The bright colors and unconventional architecture of Granville Island encase the artistic community while the business district is represented by the more monochromatic glass and steel structures. The bridges link the two sides. Each side depends on the other in a symbiotic continuum of entertainment and finance. The phrase “Only Connect” is the epigraph of E.M. Forster’s 1910 novel, Howard’s End. The novel’s theme the complex relationships between people of divergent outlooks, genders, and classes. “Only Connect” is the need to accept and link multiple outlooks on the world within a shared view.